I am not a big fan of IPAs and that will show with my rating of them as I move through the different brewers. The extra hops give the beer an extra bite that I really do not care for. If you are a fan of IPAs I am sure this is a quality beer. Pros: Great color and aroma. 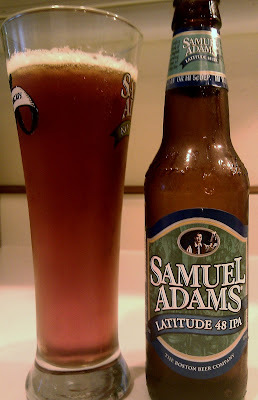 Brewers Description: Samuel Adams® Latitude 48 IPA is a unique IPA brewed with a select blend of hops from top German, English, and American growing regions all located close to the 48th latitude within the “hop belt” of the Northern Hemisphere. The combination of hops in this beer creates a distinctive but not overpowering hop character. The beer is dry hopped with Ahtanum, Simcoe®*, and East Kent Goldings hops for a powerful citrus and earthy aroma. The hop character is balanced by a slight sweetness and full body from the malt blend.